Is it possible to have a line rather than a point where the three states of a substance can exist? Most of us are familiar with state diagrams that define which of the three states a substance will take given the pressure and temperature. And that some substances, such as water for example, exhibit the behavior of a triple point - a specific pressure and temperature at which the substance can exist in equilibrium between all three states. The Wikipedia image below illustrates the phase diagram and triple point. From the phase diagram one can also see that along any of the lines separating the liquid, solid and gas phases (green, red and blue lines) that the substance can exist in equilibrium between any two states. Imagine though a substance that any one of the red, blue or green lines, is rather a long thin strip in which the third state exists. For example the green line in the diagram that separates liquid and solid would actually be a long barrow strip in which the gaseous state of the substance could exist. Thus you would have a triple point existing along a line at a set of pressures and temperatures. Are there any substances (pure compounds or mixtures) that might at least approach this behavior? Can theory predict the composition of substance by which a triple point line might occur. or do fundamental theories forbid it? Browse other questions tagged solid-state-physics ideal-gas equilibrium states-of-matter fluid-statics or ask your own question. What is the equivalent of a eutectic point for a (two-liquid)+solids system? Why does Triple point exist? Why does matter exist in 3 states (liquids, solid, gas)? 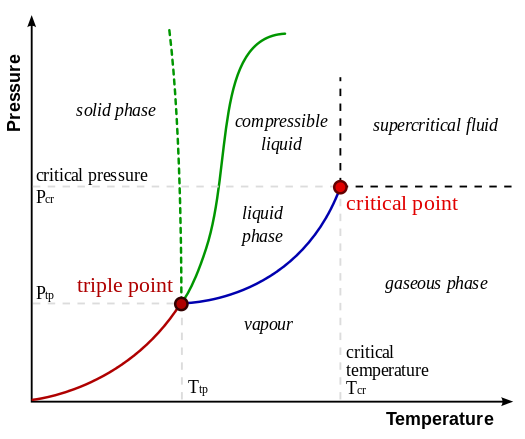 Why does a critical point exist? Does any substance melt or evaporate when cooled at constant pressure? Can a substance have zero vapour pressure above absolute zero?